Waldo spent the week scribbling a bunch of strange symbols with chalk and candlewax on the walls and floor of the office. After explaining to him that is definitely not the way summoning works (though there has been a lingering sulfur smell as of late), he finally agreed to stop vandalizing the place as long as we told him how. So, before we go check on that smell, we’re going to take a look at how summoning works in M3E. Summoning has always been a cornerstone ability in Malifaux, and often, it’s one of the strongest abilities that a player can bring to the table. Not surprisingly, many of the best masters in first and second editions were those who capable of summoning in new models. One of the goals for M3E was to keep summoning as the powerful and unique ability that it is while reigning it in and preventing a summoner from completely running away with a game. To accomplish this, we approached summoning from a couple different angles. 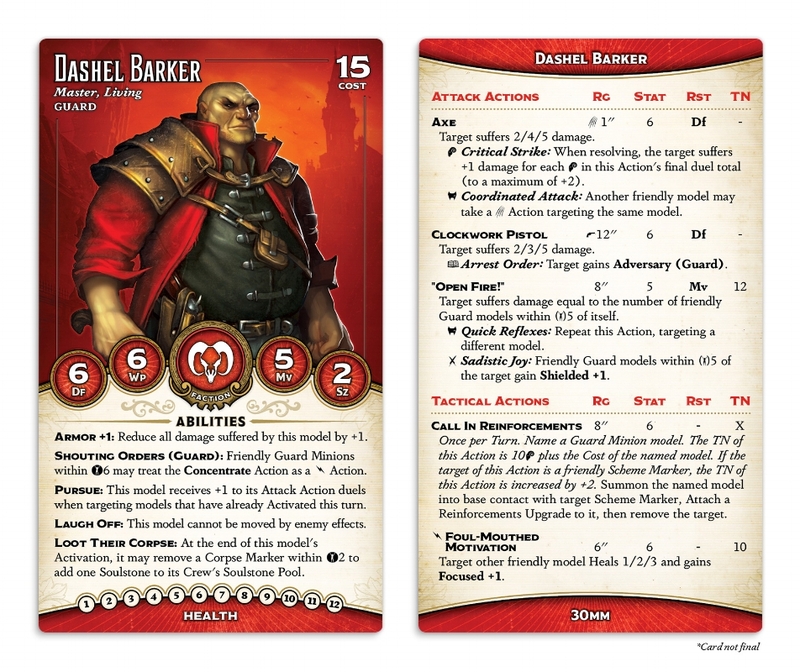 Let’s use Dashel Barker, the Guild’s newest Master, as an example. There’s a lot of fun stuff on Dashel’s stat card, but for the purposes of this article, let’s focus on his Call In Reinforcements Action. The first thing that jumps out about the Action is that it’s Once per Turn, which is a restriction that can be found on every Master-level summoning Action. Previously, in second edition, the best thing that a summoner could do was to spam their summoning Action as much as possible to flood the board with models. The rest of the summoner’s card was almost secondary to that action. Just about everyone has played a few games against Kirai and Nicodem where all they did was spam their summoning action to churn out as many new models as possible. Surprisingly, most of our playtesters ended up enjoying the summoning Masters a lot more after this change. By removing the burden of having to create and maintain a summoning engine for maximum efficiency, it freed these Masters up to do other things with their Actions. Once Dashel has called in a new Guard, he’s free to move around or shoot at his enemies without feeling like he’s “wasting” those Actions. While Dashel can only summon one model at a time (most likely due to Guild budget constraints), some of the other summoning Masters, such as Dreamer and Asami, can summon multiple models with a single Action. To do so, they just add the Cost of all of their summoned models together when determining the Action’s TN. This allows these Masters the option of summoning in two weak models in favor of a single stronger model. Each Master-level summoning Action also Attaches an Upgrade to the summoned model. Dashel Attaches the Patrolling Guard Upgrade to his summoned Guard, so let’s take a look at that Upgrade now. Patrolling Guard is Plentiful (2), which means that a player can only have two copies of that Upgrade in play at any given time. If Dashel already has two summoned models with an Attached Patrolling Guard Upgrade, then when he attempts to summon a third model, he can’t Attach the Upgrade (due to exceeding its Plentiful restriction) and the summoned model doesn’t enter play. That’s somewhat restrictive, but if Dashel is his Crew’s Leader, the Plentiful Restriction increases to Plentiful (5), which greatly expands his summoning capabilities. This helps to ensure that the power level of summoning Masters is kept in check when they’re hired as supplemental Masters in a Crew. Crews in M3E can have multiple Masters, by the way. If you want to splash some Guard summoning into a Witch Hunter Crew, for instance, you just hire Dashel like a normal model: you pay his Cost of 15, plus one if he doesn’t share your Leader’s Keyword (which in this example would be “Witch Hunter”). This has been working out pretty well in playtesting, and it’s super fun to have Dashel summoning guardsmen into a battle to support his Witch Hunter allies. Looking back at the Patrolling Guard Upgrade, you can see that after it Attaches to a model, that model gains Slow. In second edition, there were a number of summoning restrictions in the book that always seemed to catch both new and experienced players off guard, such as summoned models showing up with Slow and not being able to take Interact Actions on the turn they arrive. In M3E, those restrictions have been moved onto the summon Upgrades themselves; after Dashel summons a Guard model, for instance, it gains Slow, but it has no restrictions on its ability to take Interact Actions. Because M3E uses Upgrades to track which model is summoned, this lets us treat summoned models a bit differently than normal, purchased models. For instance, the Exorcist has a trigger that flat out kills a model with an Attached Summon Upgrade, making it quite the counter to Crews that do a great deal of summoning. All in all, these changes to the summoning rules have allowed summoning to remain as a strong option for Crews in M3E while still ensuring that there are enough checks in place to keep it from becoming the absolute best strategy in every situation. We’ve also balanced the number of summoners between Factions in order to ensure that each Faction has roughly the same amount of access to the mechanic. Arcanists have Sandeep Desai, the Bayou has Som’er “Teeth” Jones, the Guild has Dashel Barker, the Neverborn have the Dreamer, the Outcasts have Tara Blake, and the Ten Thunders have Asami Tanaka. The Resurrectionists, which have traditionally been the bastion of summoning Masters, have emerged in M3E with Kirai Ankoku and Albus Von Schtook as their summoning Masters (though Albus approaches the situation in a much more unorthodox manner than his peers). Since it’s the holiday season, we thought that we’d leave the topic of the next article up to you! What parts of M3E are you most excited to hear about? Let us know! The Other Side's Tides of Battle is Now Live!